What with the recent passing of his 200th anniversary, have you had enough about Dickens lately? All kinds of things have floated through the media the past few days about Dickens. Everything from his prodigious imagination, incomparable energy and drive, to the nasty truth that he was a poor father to his family. In particular, he was especially hard on his boys (his story suddenly reminds me of Okonkwo in Chinua Achebe’s Things Fall Apart), and also, especially in the end, coldly cruel to his wife. You may have also heard on NPR how Dickens was writing these things as first drafts for the serial releases he wrote for (sometimes several at a time). Of course there is bad writing, but for the most part we’re reading what turns out to be great literature from first drafts. You’ve probably heard about how his father was a benevolent spendthrift who spent time in Debtor’s Prison, and Dickens, at the age of formative age of 15, got a real taste of working class life. Dickens is important and massive in the annals of literature. That probably chased away my interest in him over the years. You just kind of assume you “know” Dickens because you’ve read a few of his novels back in college and graduate school or something. Also, he’s strongly associated in my mind with Christmas and Scrooge and Tiny Tim, and subconsciously I think of him as a morality tale writer. The truth is I now find his life, as much as his writing, more fascinating than ever. Of course Dickens’ narratives are profound and rich and anything but one-dimensional moralizing. On the other hand, if we think of how young he was when he died, how his own actions and way of life dramatically aged him, the secrets he took with him to his grave (so many of which are now widely-available public discourse), and I think we begin to very much see a Greek Tragedy (which is its own kind of morality tale). Dickens is just far enough back that he seems ancient, located as he is in a time that seems irretrievably distant from our online and hyper-electronically formulated lives. As a writer, I think there’s been a kind of synchronicity of psychic development in my own mind meeting up with the timing of this Smithsonian Magazine’s emphasis on “obsession.” I realized, first, that the characters in my first two novels are highly obsessed people. All the characters in The Director of Happiness are obsessed, especially of course J.J. Fleming, the Cool Hunter himself. Certainly in Simon Krimple’s Wager, the narrator is obsessed with figuring out his next step in life and the meaning of Simon Krimple’s death. Or maybe that’s the appeal of Dickens. His wide appeal to the struggling survivors, his penetrating observations into characters of all kinds. Maybe a New Critic wouldn’t want me or anyone else “meddling” with the life of an author’s past. We cannot (or at least should not) run to an author’s personal background in trying to make sense of the text. The text is what the author wants us to work with. 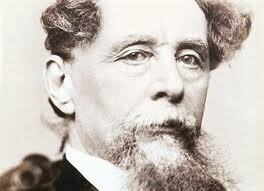 But I think the triumph (of tragic Dickens) is that, at his best as a writer, he seems so focused on his readers. And all the while he was playing out a great tragic and often secretive life in his own five-act drama. And what do we make of his strenuous wishes, and specific requests left in his will to be buried privately and without ostentation and he ended up by public demand to be buried in Westminster Abbey? Tragic or triumph, we end with irony. …but if you’re really digging some more Dickens gossip…you can learn about how he sent a ‘handsome allowance’ to his student son for alcohol. Or you can go for more wholesome family fun at Dickens World. Is Joining The Grid Really Joining The Dark Side?